Kailash Mansarovar tour Tibet with experts, join our kailas tour at Saga Dawa festival and other dates!! The Kailash mansarovar tour include stunning mountain views, untouched cultures, incradiable landscapes, a pligrimage trip to one of the most remote and beautiful places on Earth! Bookings are open for 2008 kailash - Mansarovar tour please contact us for details . We have the following dates scheduled for this Holy Mt. 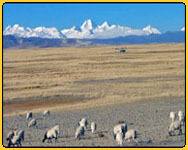 Kailash - Mansarovar - Lhasa - Guge Tour 2011. that are guaranteed to operate with a minimum of 2 or 3 persons in the group. The Kailash tour is also available on a private basis to suit your own dates. *Above departure dates will bring you at Lake - Mansarovar during Full Moon Night. We have Kailash tour available from Limi Valley and Simikot area as well. 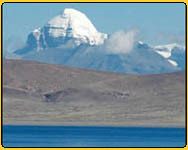 Bookings are open for our 2010 Kailash Mansarovar tour, please contact us for details. April 15 as per Tibetan calendar and June 18 as per Gregorain Calendar. Saga Dawa marks the day when Buddha Shakyamuni was conceived in the womb of his mother, Queen Mayadevi, gained victory over demons (35 years later) and gained complete enlightenment under Bodhi Tree . It is also said that on this day half a century later, Buddha passed into parinirvana, the ultimate state of peace, at Kushinagara. People circulate the flagpole that is down on the ground now at Tharboche ( near kailash) . They pray and throw 'wind horses' (little pieces of colored paper with Buddhist scriptures on them) into the air. They help to remove last year's prayer flags and attach new ones. As a visitor you are almost forced to follow them as they go around time after time. Along the sides, on the slope of the nearby hills, a lot of people are sitting to watch the 'spectacle' and there are musicians, which play all the time on their horns and symbols. 2008 is a special year in Tibetan Buddhism, when pilgrimage is particularly meritorious. During the period of the Saga Dawa month, one circumambulation of the holy mountain is popularly considered to have the merit of a 100 thousand times on top of that to be purifying one life time. At time for the full moon of Saga Dawa more pilgrims than usual visit Kailash. In Tarpochen, at the foot of the holy mountain, there will be a big Buddhist festival. Tarpochen represents the navel of the world and every year Tibetans erect here a giant pole while many other ceremonies and rituals are carried out. This is certainly the most important day for Tibetan pilgrims at Mt. Kailash. You will have more time than usual at Lake Manasarovar so that it is possible to do this kora as well and finally you can extend a visit of Lhasa if you like. Join us for 2010 Saga Dawa Kailash tour, bookings open now. Holy Mount Kailash which is believed to have been formed 30 million years ago when Himalayas were in their early stage of formation, is one of the most revered places in the Himalayas. Mt. Kailash, 6,740 mtr high peak is situated to the north of the Himalayan barrier, wholly within Tibet. It is the perfect mountain with awesome beauty, with 4 great faces. It is the spiritual centre for four great religions: Tibetan Buddhism, Hinduism, the Jain religion and the pre-Buddhist animistic religion - Bonpo. For the Hindus Mount Kailash is the earthly manifestation of Mt. Meru, their spiritual centre of the universe, described as a fantastic 'world pillar' 84,000 miles high, around which all else revolves, its roots in the lowest hell and its summit kissing the heavens. On the top live their most revered God, Shiva, and his consort Parvati. For the Jains, an Indian religious group, Kailash is the site where their first prophet achieved enlightenment. For the older, more ancient religion of Bon, it is the site where its founder Shanrab is said to have descended from heaven. 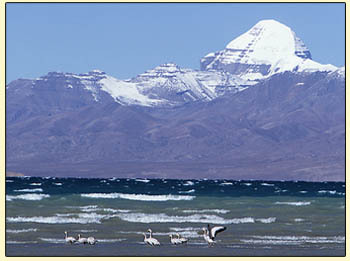 Spread out on the Tibetan plateau beside Mount Kailash is the giant lake of shifting colors - Lake Mansarovar. Brahma, the creator, had a mind (‘Man’) for the creation of a lake (‘Sarovar’), hence its name. A pilgrimage to Mount Kailash and a bath in the Mansarovar is believed to bring about salvation (Moksha) and washed away all the sins of life.Over the centuries pilgrims have constantly journeyed immense distances to achieve enlightenment or cleanse themselves of sin, braving enormous distances, particularly harsh weather and bandit attacks. People have been visiting Kailash - Mansarovar for centuries. It used to be very hard journey in the past; today Earthbound Expeditions can bring you there with help of Landcrusiors via Kathmandu. This Kailash Tibet adventure begins with the fly across the Himalaya west into Tibet to Lhasa. Then we drive to Holy Lake Mansarovar. Here you will join the throngs of pilgrims who, for centuries, have converged on this remote southwestern corner of Tibet to circumambulate the sacred mountain, considered to be the center of the universe by Hindus and Buddhist alike. Kailash enjoys great popularity the folk religion of Tibet - it is the soul of the country and assures protection for all Tibetans. The fountain head of four great Asian rivers ( Indus, Sutlej, Bramhaputra and Karnali), few mountain reveals Kailash for its mystique, (Above photo of ruins of guge kingdom - Tholing Tsaparang in west Tibet is taken by Mr. Matt, who did mustang trek in Nepal with us in 2007, his more photos can view from link below: http://www.mdnphoto.com/asiatraverse/leg3_nepalgallery/index.php) isolation and prominence, for 3 days you will walk with pilgrims around this almost perfectly symmetrical mountain kailas before the trek drive back into Nepal. Your kailash trek pioneered by Earthbound Expeditions takes you into northern riches of the country where only few trekkers have walked these trials, unchanged over the ages. The encounter with the herders, pilgrims and the local people will be lively and make for precious memory. It is an experience of a lifetime...! Please hear from our clients who have been to Kailash - mansarovar tour with us and how much they enjoyed it with us. Arrive Kathmandu / Chengdu, Our representative will come to receive you at the Airport. Hotel in B/ B basis. Two days Sightseeing of Kathmandu or Chengdu and preparation for the trek. B/B. ( Bhaktapur, Patan, Syambhunath and Kathmandu Durbar squares). Drive to Lhatse, Overnight camp. From this day we will be staying in tented camp. Rest day in Lake Manasaravor. Holy bath and explore around. Kora start, Trek to Daira phuk Gompa. Enjoy the close up view of north face of holy Kailash . B, L, D .
Trek to La chu valley after crossing the Dormala Pass (5600 mtrs). B,L, D. Camp near Medecine Buddha Mountain. Day 19: Sightseeing Tholing and Tsaparang - the moon land, Guge Kingdom B, L, D .
Day 25: Free day we will take you for evening Culture Show and dinner. Day 26: Departure or free day. Namaste! All the airport pick up and drop service in Kathmandu / Chengdu. Meals in Kathmandu and in Tibet (Lhasa, Gyantse, Xigatse). 3 stars hotel in Kathmandu on bed and breakfast basis. Bar bills (soda pop, beer, water etc) and other personal expenses. Kathmandu valley sightseeing with guide and entrance permits. Airport departure tax (Aprox US $15 from Kathmandu). Emergency rescue charges if necessary. Hotel in Tibet from day 04-08 on twin sharing and breakfast basis and rest is tented camp. Tents , sleeping mats and camping gears. Any other Expenses which are not mentioned to your left. 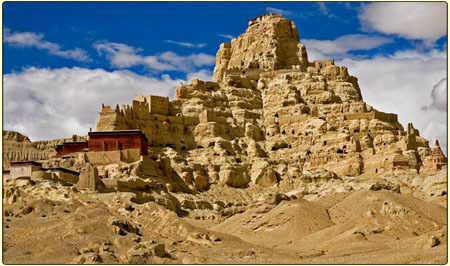 All entrance fees in Tibet with sightseeing. Necessary yaks on trek around Kailash for luggage, equipment and supplies. please try to travel always with a direct agent and small group - private departure dates available. 3% Discount available to all bookings that is confirmed by 30th March '09 Kailash - Mansarovar tour is totally safe, as we spent more days in Tibet. We have been organizing a regular trip each year targeting Saga Dawa Festival near Kailash. Special trip for Karnali river source, Indus River source and Bramhaputra river source can be organized. If you would like more detailed information or customized itinerary, please contact us.